Historic Home in Chickasaw, Alabama, historic district. 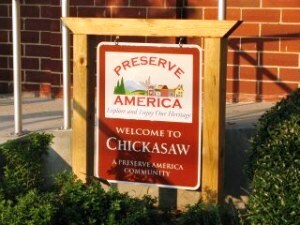 Chickasaw, Alabama proudly displays its Preserve America Community sign. Chickasaw, Alabama (population 6,364), came into being during World War I, when the Tennessee Coal and Iron Company bought land in the area to construct a shipyard. The company built the town that would become Chickasaw, a planned community with attractive and well-built homes for the shipyard workers, and more homes were constructed during the boom years of World War II. Following the war, the company town was privatized and incorporated. 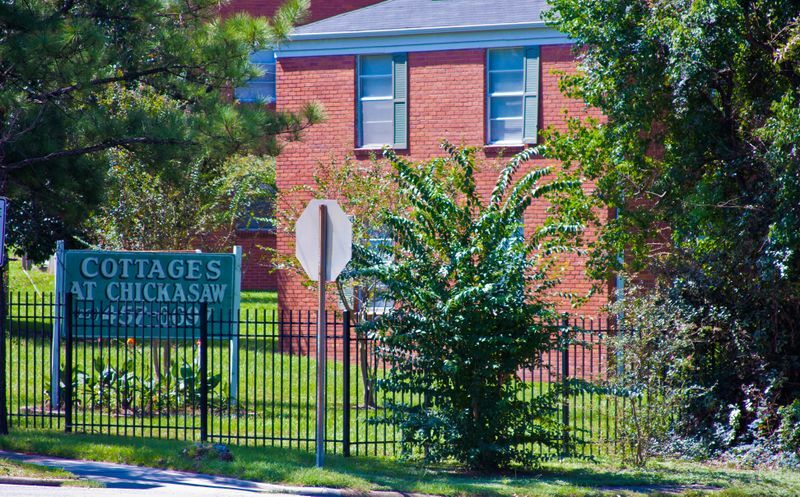 Many of the community's original homes remain and form the core of a local historic district and the Chickasaw Shipyard Village Historic District, listed on the National Register of Historic Places. To promote heritage tourism, the City of Chickasaw has placed a large billboard on the nearby interstate highway inviting travelers to visit the community's historic area, and the Chickasaw Historic Preservation Society has developed a driving tour of the historic homes. One home on the tour, the Lange/Bush House, was recently renovated and sold for a price higher than any previous historic property in Chickasaw. Throughout the historic district, property values are rising along with recognition of its historic significance.